Prostaglandin E synthase (PGES) including isoenzymes of membrane-associated PGES (mPGES)-1, mPGES-2, and cytosolic PGES (cPGES) is the recently identified terminal enzyme of the arachidonic acid cascade. PGES converts prostaglandin (PG)H2 to PGE2 downstream of cyclooxygenase (COX). We investigated the expression of PGES isoenzyme in articular chondrocytes from patients with osteoarthritis (OA). Chondrocytes were treated with various cytokines and the expression of PGES isoenzyme mRNA was analyzed by the reverse transcription–polymerase chain reaction and Northern blotting, whereas Western blotting was performed for protein expression. The subcellular localization of mPGES-1 was determined by immunofluorescent microscopy. Conversion of arachidonic acid or PGH2 to PGE2 was measured by enzyme-linked immunosorbent assay. Finally, the expression of mPGES-1 protein in OA articular cartilage was assessed by immunohistochemistry. Expression of mPGES-1 mRNA in chondrocytes was significantly induced by interleukin (IL)-1β or tumor necrosis factor (TNF)-α, whereas other cytokines, such as IL-4, IL-6, IL-8, IL-10, and interferon-γ, had no effect. COX-2 was also induced under the same conditions, although its pattern of expression was different. Expression of cPGES, mPGES-2, and COX-1 mRNA was not affected by IL-1β or TNF-α. The subcellular localization of mPGES-1 and COX-2 almost overlapped in the perinuclear region. In comparison with 6-keto-PGF1α and thromboxane B2, the production of PGE2 was greater after chondrocytes were stimulated by IL-1β or TNF-α. Conversion of PGH2 to PGE2 (PGES activity) was significantly increased in the lysate from IL-1β-stimulated chondrocytes and it was inhibited by MK-886, which has an inhibitory effect on mPGES-1 activity. Chondrocytes in articular cartilage from patients with OA showed positive immunostaining for mPGES-1. These results suggest that mPGES-1 might be important in the pathogenesis of OA. It might also be a potential new target for therapeutic strategies that specifically modulate PGE2 synthesis in patients with OA. Osteoarthritis (OA) is the most common chronic articular condition and is primarily characterized by the progressive destruction of articular cartilage. Although OA is traditionally defined as a non-inflammatory arthropathy, many reports have suggested that proinflammatory cytokines such as interleukin (IL)-1β and tumor necrosis factor (TNF)-α might be important in this disease [1–3]. Stimulation of chondrocytes by proinflammatory cytokines increases the production of major cartilage-degrading enzymes, called matrix metalloproteinases [4–6], inhibits the synthesis of cartilage proteoglycans and/or type II collagen [7–9], stimulates the production of reactive oxygen species such as nitric oxide [10–12], and increases the production of prostaglandin (PG)E2 [13, 14]. It was recently shown that high levels of PGE2 production by OA tissues are observed after stimulation by IL-1β, which might have a role in the degeneration of bone and cartilage associated with OA . It was also reported that the nitric oxide-induced death of OA chondrocytes was enhanced through the production of PGE2 by the chondrocytes themselves . In the PGE2 synthesis pathway, cyclooxygenase (COX) is a key enzyme that metabolizes arachidonic acid to PGG2 and PGH2. There are two isoforms of COX, which are designated COX-1 and COX-2 [17, 18]. COX-1 is expressed constitutively in various cells and tissues, and is important in maintaining homeostasis. In contrast, COX-2 is induced in inflammatory cells and tissues by various stimuli including cytokines, suggesting that COX-2 has a key role in the process of inflammation. Increased PGE2 production in response to stimulation by proinflammatory cytokines coincides with the upregulation of COX-2 expression. PGE synthase (PGES) acts downstream of COX to catalyze the conversion of PGH2 into PGE2 [19, 20]. At least three forms of human PGES have been cloned and characterized, including membrane-associated PGES (mPGES)-1 , mPGES-2 , and cytosolic PGES (cPGES) . Among these, mPGES-1 was originally known as microsomal glutathione S-transferase 1-like 1 (MGST1-L1), and it is a glutathione-dependent enzyme that shows coordinated induction with COX-2 by inflammatory stimuli in various cells and tissues [21, 24]. We and others have reported that mPGES-1 was coordinately induced with COX-2 by IL-1β in synovial fibroblasts from patients with rheumatoid arthritis [25–27]. It was also reported that mPGES-1 is expressed in joint tissues isolated from animals with arthritis [28, 29]. Moreover, a recent study demonstrated that mPGES-1-deficient mice showed a significant reduction of the inflammatory features and histopathological changes such as pannus formation and joint erosion of experimental inflammatory arthritis . Although the significance of PGE2 in the pathophysiology of OA has been demonstrated, the role of each PGES isoenzyme has not yet been determined. Accordingly, we studied the effects of various inflammatory cytokines on the expression of PGES isoenzymes in OA chondrocytes. Rabbit anti-human mPGES-1 polyclonal antibody, rabbit anti-human cPGES polyclonal antibody, rabbit anti-human COX-2 polyclonal antibody, PGE2, PGH2, and enzyme-linked immunosorbent assay (ELISA) kits for PGE2, 6-keto-PGF1α, and thromboxane (TX)B2 were all purchased from Cayman Chemical Co. (Ann Arbor, MI). Mouse anti-human COX-1 monoclonal antibody and MK-886 were purchased from Wako Pure Chemical Industries (Osaka, Japan). Goat anti-human COX-2 polyclonal antibody was obtained from Santa Cruz Biotechnology (Santa Cruz, CA). Horseradish peroxidase (HRP)-conjugated goat anti-rabbit IgG, HRP-conjugated goat anti-mouse IgG, tetramethylrhodamine β-isothiocyanate-conjugated donkey anti-goat IgG, and fluorescein isothiocyanate-conjugated donkey anti-rabbit IgG were obtained from Jackson ImmunoResearch (West Grove, PA). Dulbecco's modified Eagle's medium (DMEM), fetal bovine serum (FBS), and TRIzol reagent were from Invitrogen (Carlsbad, CA). Recombinant human IL-1β, TNF-α, IL-4, IL-6, IL-8, IL-10, and interferon-γ were from BD Biosciences (San Diego, CA). The Megaprime DNA labeling system, [α-32P]dCTP, nylon membrane (Hybond N+), and enhanced chemiluminescence reagent were purchased from Amersham Pharmacia Biotech (Little Chalfont, Bucks., UK), and poly(vinylidene difluoride) membrane (Immobilon-P) was obtained from Millipore (Bedford, MA). Cartilage samples were obtained at the time of joint replacement surgery from patients with OA who fulfilled the American College of Rheumatology criteria for this disease . These experiments were performed in accordance with a protocol approved by the ethics committee of St Marianna University, and all patients gave written consent to the use of their tissues for this research. Chondrocytes were prepared as described elsewhere . In brief, cartilage samples were minced and digested with 1 mg/ml collagenase in DMEM for 18 h at 37°C, filtered through a nylon mesh, and washed extensively. Then the isolated chondrocytes were seeded at a high density in tissue culture flasks coated with type I collagen and were incubated in DMEM containing 10% FBS, 100 units/ml penicillin, and 100 μg/ml streptomycin at 37°C under an atmosphere of 5% CO2. At confluence, the cells were detached and passaged, and the second-passage cells were used in subsequent experiments. The chondrocytes' phenotype was assessed by analyzing the expression of type II collagen with the reverse transcription–polymerase chain reaction (RT–PCR) (Fig. 1). OA synovial fibroblasts and normal dermal fibroblasts were prepared as described previously [25, 33]. Phenotypic features of chondrocytes. (a) Morphology of chondrocytes and synovial fibroblasts from patients with osteoarthritis. (b) Chondrocytes from four patients with osteoarthritis were incubated for 12 h. Total RNA from the cells was subjected to reverse transcription–polymerase chain reaction (RT–PCR) for type I collagen, type II collagen, and glyceraldehyde-3-phosphate dehydrogenase (GAPDH), as described in Materials and methods. Synovial fibroblasts and dermal fibroblasts were used as controls. (c) Chondrocytes from osteoarthritis patients were incubated with IL-1β (1 ng/ml) or tumor necrosis factor-α (TNFα; 10 ng/ml) for 12 h. Total RNA from the cells was subjected to RT–PCR for type I collagen, type II collagen, and GAPDH, as described in Materials and methods. Representative results from three patients are shown here. Cells were seeded into the wells of a six-well plate coated with type I collagen at a density of 5 × 104 cells/cm2 in culture medium containing 1% FBS, and then were cultured under various conditions. RNA from the cells was extracted with TRIzol reagent in accordance with the manufacturer's instructions. Reverse transcription was performed with a SuperScript preamplification system (Invitrogen, Carlsbad, CA), in accordance with the manufacturer's instructions, with 1 μg of total RNA from the cells as a template. Equal amounts of each reverse-transcription product were amplified by PCR with HotStarTaq polymerase (Qiagen, Valencia, CA). After initial denaturation at 95°C for 15 min, PCR involved amplification cycles of 30 s at 95°C, 30 s at 56°C, and 45 s at 72°C, followed by elongation for 5 min at 72°C. The sequences of the primers, the size of the PCR products, and the number of amplification cycles are shown in Table 1. The amplified cDNA fragments were resolved by electrophoresis on 1.5% (w/v) agarose gel, and were detected under ultraviolet after staining of the gel with ethidium bromide. COX, cyclooxygenase; GAPDH, glyceraldehyde-3-phosphate dehydrogenase; mPGES, membrane-associated prostaglandin E synthase; cPGES, cytosolic prostaglandin E synthase. aFor each target gene, the upper primer is the forward primer and the lower primer is the reverse primer. Cells were seeded into the wells of a six-well plate coated with type I collagen at a density of 5 × 104 cells/cm2 in culture medium containing 1% FBS, and were then cultured under various conditions. Northern blotting was performed as described previously . Total RNA (4 μg) was extracted from the cells with TRIzol reagent and was subjected to electrophoresis on 1% formaldehyde/agarose gel, followed by transfer to a Hybond N+ membrane and hybridization with cDNA probes that had been labeled with [α-32P]dCTP by random priming. After hybridization, the membranes were washed and the RNA bands were detected by autoradiography. Cells (at a density of 5 × 104 cells/cm2) were cultured under various conditions in medium containing 1% FBS. Subsequently, the cells were lysed in Tris-buffered saline (TBS) containing 0.1% sodium dodecyl sulfate (SDS), and the protein content of the lysates was determined with the bicinchoninic acid protein assay reagent (Pierce, Rockford, IL), with bovine serum albumin as the standard. Cell lysates were adjusted to 5 μg of protein and were then applied to SDS-polyacrylamide gels (10–20%) for electrophoresis, as reported previously . Next, the proteins were electroblotted onto Immobilon-P poly(vinylidene difluoride) membranes with a semidry blotter (Atto, Tokyo, Japan). After the membranes had been blocked in 10 mM TBS containing 0.1% Tween-20 (TBS-T) and 5% skimmed milk, the primary antibody (rabbit anti-human mPGES-1 antibody, rabbit anti-human cPGES antibody, mouse anti-human COX-1 antibody, or rabbit anti-human COX-2 antibody) was added at a dilution of 1:500 (mPGES-1 and cPGES) or 1:200 (COX-1 and COX-2) in TBS-T, and incubation was performed for 1.5 h. After the membranes had been washed with TBS-T, the secondary antibody (HRP-conjugated goat anti-rabbit antibody or HRP-conjugated goat anti-mouse antibody) was added (at a dilution of 1:10,000 or 1:5,000, respectively, in TBS-T) and incubation was performed for 1 h. After further washing with TBS-T, protein bands were detected with an enhanced chemiluminescence Western blot analysis system. Immunofluorescent microscopy was performed as reported previously . In brief, cells were seeded at a density of 2.5 × 104 cells/cm2 onto culture slides coated with type I collagen and were incubated with or without 1 ng/ml IL-1β for 48 h. After removal of the supernatants, the cells were fixed with 4% (w/v) paraformaldehyde in phosphate-buffered saline (PBS) for 30 min at 4°C. Then the cells were permeabilized with 0.1% Triton-X in PBS for 3 min. After blocking with 1% (w/v) bovine serum albumin in PBS for 1 h at 20–25°C, rabbit anti-human mPGES-1 polyclonal antibody and goat anti-human COX-2 polyclonal antibody (premixed so that the final dilutions were, respectively, 1:100 and 1:250 in PBS containing 1% albumin) were added and incubation was done for 1.5 h at 20–25°C. After washing with PBS, tetramethylrhodamine β-isothiocyanate-conjugated and fluorescein isothiocyanate-conjugated secondary antibodies were added at 1:50 dilution in PBS containing 1% albumin, and incubated for 1 h. Then the glass slides were sealed under coverslips using Vectashield Mounting Medium (Vector Laboratories, Burlingame, CA) and examined under an IX71 microscope connected to a Cool SNAP HQ digital camera (Olympus, Tokyo, Japan). Cells stimulated with IL-1β or TNF-α were washed with DMEM and incubated for a further 30 min with 3 μM arachidonic acid, as reported previously [25, 34]. 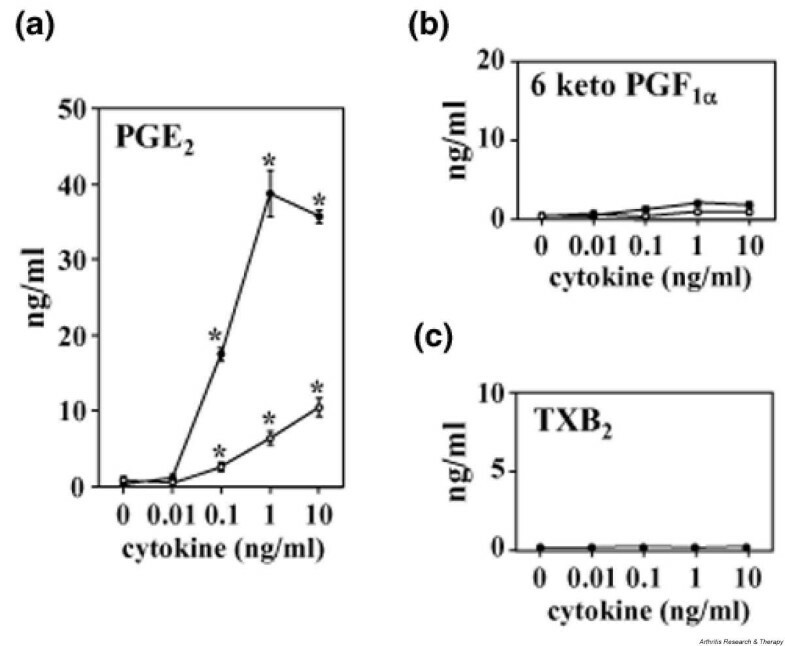 The culture medium was then harvested, and the concentrations of PGE2, 6-keto-PGF1α (a stable metabolite of PGI2), and TXB2 (a stable metabolite of TXA2) were measured by ELISA. PGES activity was measured by assessment of the conversion of PGH2 to PGE2, as reported previously [25, 35]. In brief, cells (at a density of 5 × 104 cells/cm2) were cultured under various conditions in medium containing 1% FBS. The cells were then scraped off the dish and lysed by sonication (twice for 10 s each at 1 min intervals) in 100 μl of 1 M Tris–HCl (pH 8.0). After centrifugation of the lysate at 15,000 g for 1 min at 4°C, the supernatant was used to measure PGES activity. For assessment of PGES activity, an aliquot of each supernatant equivalent to 50 μg of protein was incubated with 2 μg of PGH2 for 30 s at 24°C in 0.1 ml of 1 M Tris–HCl containing 2 mM glutathione, in the absence or presence of MK-886. The reaction was terminated by the addition of 100 mM FeCl2; the reaction mixture was then left to stand at 20–25°C for 15 min. After centrifugation of the reaction mixture, the PGE2 concentration in the supernatant was measured with an ELISA kit. Cells were seeded at a density of 5 × 104 cells/cm2 in culture medium containing 1% FBS and were incubated with IL-1β for 48 h. In experiments involving treatment with MK-886, it was added 30 min before IL-1β. The culture supernatant was then harvested and the PGE2 concentration was measured with an ELISA kit. Tissue sections were incubated for 5 min with 3% (v/v) H2O2. After blocking with 1% (w/v) bovine serum albumin in PBS for 30 min at 20–25°C, rabbit anti-human mPGES antibody or goat anti-human COX-2 antibody (diluted 1:100 or 1:200, respectively, in PBS containing 1% albumin) was added and incubation was performed for 1.5 h at 20–25°C. After being washed, the sections were incubated with the biotinylated secondary antibody, followed by streptavidin–HRP complex and 3,3'-dimaminobenzidine tetrahydrochloride in accordance with the manufacturer's protocol (LSAB staining kit; Dako, Carpinteria, CA). As adsorption controls, primary antibodies against mPGES-1 and COX-2 were used that had been previously reacted with mPGES-1 (10 μg/ml) or COX-2 peptide (10 μg/ml), respectively. In addition, rabbit anti-human mPGES-1 was replaced with normal rabbit IgG as a negative control. Results are expressed as means ± SD for triplicate experiments, and representative results from three independent patients are shown. Statistical analysis for triplicate experiments was performed with Tukey's multiple comparison test; P < 0.05 was considered significant. Morphology and collagen mRNA expression were examined for assessment of the chondrocyte phenotype. The morphology of chondrocytes used in this study was obviously different from that of synovial fibroblasts (Fig. 1a). Type I collagen mRNA was expressed in chondrocytes as well as synovial fibroblasts and dermal fibroblasts. In contrast, expression of type II collagen mRNA was detected only in chondrocytes, as shown in Fig. 1b. Moreover, expression of type II collagen mRNA as well as type I collagen mRNA in chondrocytes was maintained after stimulation of IL-1β or TNF-α for 12 h (Fig. 1c). The expression of mRNA for mPGES-1 and COX-2 in chondrocytes from patients with OA was assessed by RT–PCR after the cells had been treated with various cytokines for 12 h. As shown in Fig. 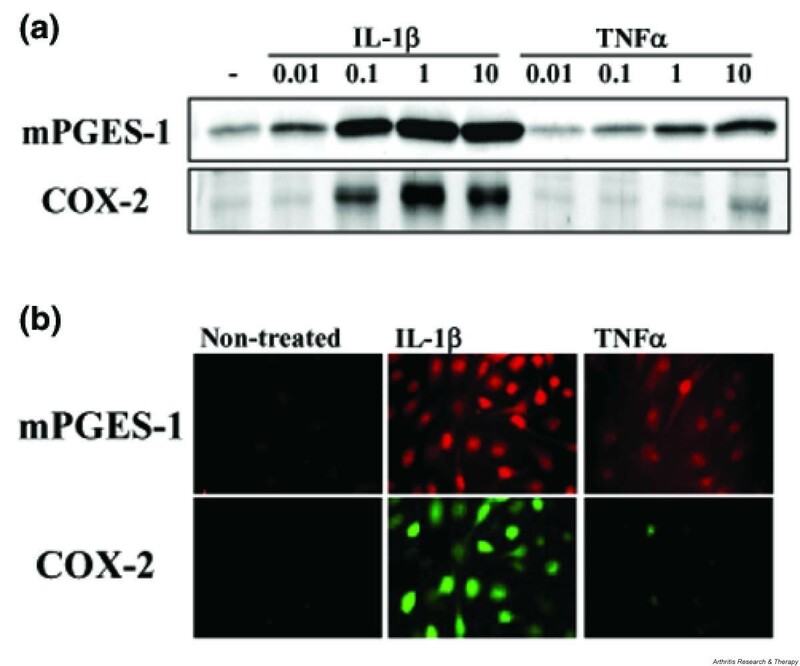 2a, TNF-α or IL-1β induced the expression of mPGES-1 and COX-2 mRNA in chondrocytes. In contrast, IL-4, IL-6, IL-8, IL-10, and interferon-γ all had no effect on the expression of mPGES-1 or COX-2 mRNA. 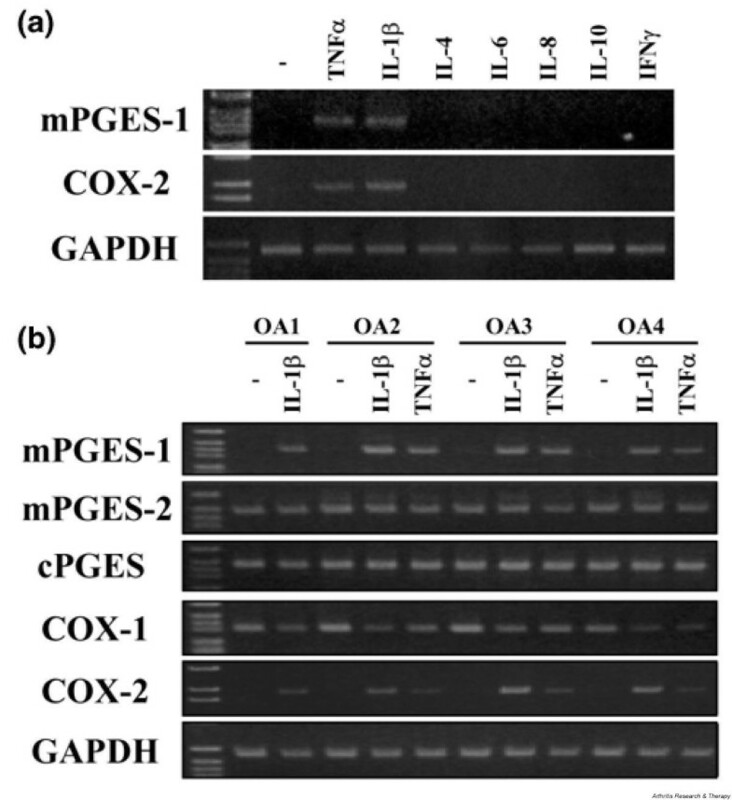 Effects of cytokines on the expression of prostaglandin E synthase (PGES) and cyclooxygenase (COX) isoenzyme mRNAs in chondrocytes. (a) Chondrocytes from patients with osteoarthritis were incubated with interleukin (IL)-1β (1 ng/ml), tumour necrosis factor (TNFα; 10 ng/ml), IL-4 (10 ng/ml), IL-6 (10 ng/ml), IL-8 (10 ng/ml), IL-10 (10 ng/ml), or interferon-γ (IFNγ; 100 ng/ml) for 12 h. Total RNA from the cells was subjected to reverse transcription–polymerase chain reaction (RT–PCR) for membrane-associated PGES (mPGES)-1, COX-2, and glyceraldehyde-3-phosphate dehydrogenase (GAPDH), as described in Materials and methods. Representative results from three patients are shown here. (b) Chondrocytes from four patients with osteoarthritis were incubated with IL-1β (1 ng/ml) or TNF-α (10 ng/ml) for 12 h. Total RNA from the cells was subjected to RT–PCR for mPGES-1, mPGES-2, cytosolic PGES (cPGES), COX-1, COX-2, and GAPDH, as described in Materials and methods. Representative results are shown here. We next examined the induction of mRNA for PGES and COX isoenzymes by IL-1β or TNF-α in chondrocytes from four patients with OA (Fig. 2b). Expression of mPGES-1 and COX-2 mRNA was significantly induced by IL-1β or TNF-α in chondrocytes from all four patients. In contrast, mRNA for mPGES-2, cPGES, and COX-1 was constitutively expressed in unstimulated chondrocytes, and exposure to IL-1β or TNF-α had little effect on the expression of these mRNAs. The pattern of mRNA expression for each enzyme was similar in all four patients. Subsequently, we examined the effect of various concentrations of IL-1β and TNF-α on mPGES-1 and COX-2 mRNA by Northern blot analysis. As shown in Fig. 3, expression of mPGES-1 and COX-2 mRNA was induced by IL-1β in a concentration-dependent manner. TNF-α also induced expression of mPGES-1 mRNA, but had a weaker effect than IL-1β. The effect of TNF-α on the expression of COX-2 mRNA was also weaker than that of IL-1β. Expression of membrane-associated prostaglandin E synthase-1 (mPGES-1) and cyclooxygenase-2 (COX-2) mRNA in cytokine-stimulated chondrocytes. Chondrocytes from patients with osteoarthritis were incubated with interleukin-1β (IL-1β; 0.01–10 ng/ml) or tumor necrosis factor-α (TNF-α; 0.01–10 ng/ml) for 12 h. Total RNA from the cells was subjected to Northern blot analysis for mPGES-1, COX-2, and glyceraldehyde-3-phosphate dehydrogenase (GAPDH), as described in Materials and methods. Representative results from three patients are shown. Expression of mPGES-1 and COX-2 protein in chondrocytes stimulated with IL-1β or TNF-α was investigated by Western blot analysis and immunofluorescent microscopy (Fig. 4). As shown in Fig. 4a, both mPGES-1 and COX-2 protein were induced by IL-1β and TNF-α, similar to the results for mRNA expression shown in Fig. 3. Colocalization of these enzymes was observed in the perinuclear region of IL-1β-stimulated chondrocytes (Fig. 4b). Expression of membrane-associated prostaglandin E synthase (mPGES-1) and cyclooxygenase-2 (COX-2) protein in cytokine-stimulated chondrocytes. (a) Chondrocytes from osteoarthritis patients were incubated for 48 h with interleukin-1β (IL-1β; 0.01–10 ng/ml) or tumour necrosis factor-α (TNFα; 0.01–10 ng/ml). Protein from the cells was subjected to Western blot analysis for mPGES-1 and COX-2. (b) Chondrocytes from osteoarthritis patients were incubated for 48 h with IL-1β (1 ng/ml) or TNF-α (10 ng/ml). The cells were then double-immunostained with tetramethylrhodamine β-isothiocyanate for mPGES-1 (upper row) and fluorescein isothiocyanate for COX-2 (lower row), and were examined under a Fluoview laser fluorescence microscope. Representative findings from three patients are shown here. To determine the profile of PG synthesis in OA chondrocytes, cells were exposed to various concentrations of IL-1β (0.01–10 ng/ml) or TNF-α (0.01–10 ng/ml) for 24 h and the conversion of exogenous arachidonic acid to PGE2, 6-keto-PGF1α (a stable metabolite of PGI2), and TXB2 (a stable metabolite of TXA2) was measured by ELISA. As shown in Fig. 5a, PGE2 synthesis was markedly increased by IL-1β or TNF-α (to a smaller extent) in a concentration-dependent manner. The pattern of PGE2 production was similar to results shown in Fig. 2. In contrast, the changes in 6-keto-PGF1α (Fig. 5b) and TXB2 (Fig. 5c) after the addition of IL-1β or TNF-α were almost negligible compared with the effect on PGE2. Production of prostaglandin E2 (PGE2) (a), 6-keto-PGF1α (b), and thromboxane (TX)B2 (c) in cytokine-stimulated chondrocytes. Chondrocytes from osteoarthritis patients were incubated for 24 h with interleukin-1β (IL-1β; 0.01–10 ng/ml, filled circles) or tumor necrosis factor-α (0.01–10 ng/ml, open circles). After being washed, the cells were incubated for a further 30 min with 3 μM arachidonic acid; the PGE2, 6-keto-PGF1α (a stable metabolite of PGI2), and TXB2 (a stable metabolite of TXA2) concentrations in the medium were then measured by enzyme-linked immunosorbent assay. Data are means ± SD for triplicate cultures, and representative results from three patients are shown. *P < 0.01 compared with untreated control cells. The expression of mRNA (Fig. 6a) and protein (Fig. 6b) for PGES and COX isoenzymes at various times after stimulation with IL-1β was assessed by Northern and Western blotting, respectively. Expression of mPGES-1 mRNA showed a gradual increase, reaching a maximum after 24–48 h of exposure to IL-1β. Expression of mPGES-1 protein showed a slight increase at 12 h, and then gradually increased until at least 72 h. In contrast, COX-2 mRNA increased rapidly after the start of IL-1β stimulation, and its expression remained maximal until 48 h. The COX-2 protein level also showed a rapid increase within 6 h and expression was maximal between 12 and 48 h; it decreased again at 72 h. Expression of mPGES-1 was delayed compared with that of COX-2. In contrast, the levels of cPGES and COX-1 mRNA and protein were not affected by IL-1β. 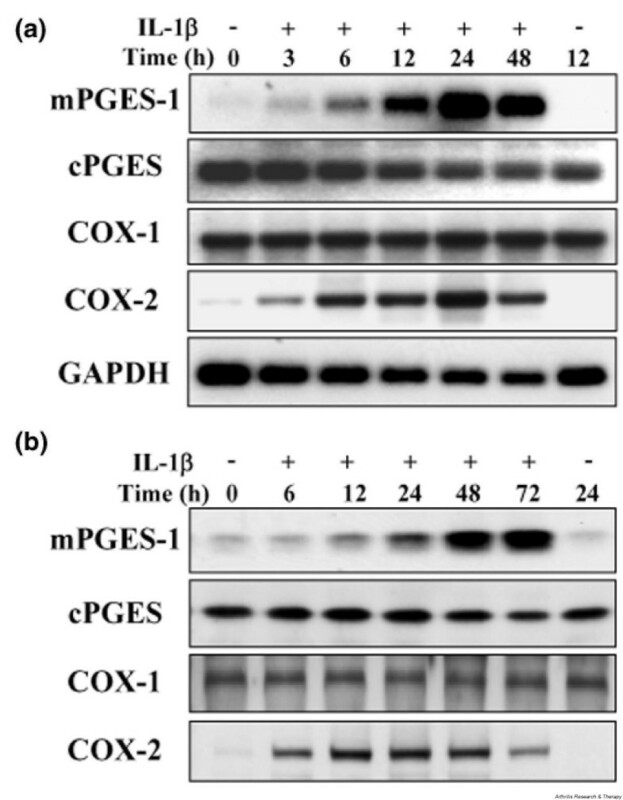 Time course of the expression of prostaglandin E synthase (PGES) and cyclooxygenase (COX) isoenzymes in chondrocytes stimulated with interleukin-1β (IL-1β). Chondrocytes from osteoarthritis patients were incubated with IL-1β (1 ng/ml) for the indicated durations. (a) Total RNA from the cells was subjected to Northern blot analysis for membrane-associated PGES-1 (mPGES-1), cytosolic PGES (cPGES), COX-1, COX-2, and glyceraldehyde-3-phosphate dehydrogenase (GAPDH). (b) Protein from the cells was subjected to Western blot analysis for mPGES-1, cPGES, COX-1, and COX-2. Representative results from three patients are shown here. To investigate whether PGES enzymatic activity was upregulated by IL-1β, we measured the conversion of PGH2 to PGE2 in lysates prepared from IL-1β-stimulated chondrocytes at various times (Fig. 7a). PGES activity increased gradually until 72 h after the start of IL-1β stimulation. These results matched the pattern of mPGES-1 protein expression (Fig. 6b). Induction of prostaglandin E synthase (PGES) activity in chondrocytes stimulated with IL-1β (IL-1β). (a) For estimation of the PGES activity that produces prostaglandin (PG)E2 from PGH2, exogenous PGH2 (2 μg) was added to lysates of chondrocytes that had been incubated with (filled circles) or without (open circles) IL-1β (1 ng/ml) for the indicated durations. The lysates were then incubated at 24°C for 30 s in the presence of reduced glutathione, the reaction was stopped with 100 mM FeCl2, and the PGE2 concentration was measured by enzyme-linked immunosorbent assay. Spontaneous conversion of PGH2 to PGE2 in the absence of cell lysates was subtracted from each result. Data are means ± SD for triplicate cultures; representative results from three patients are shown. 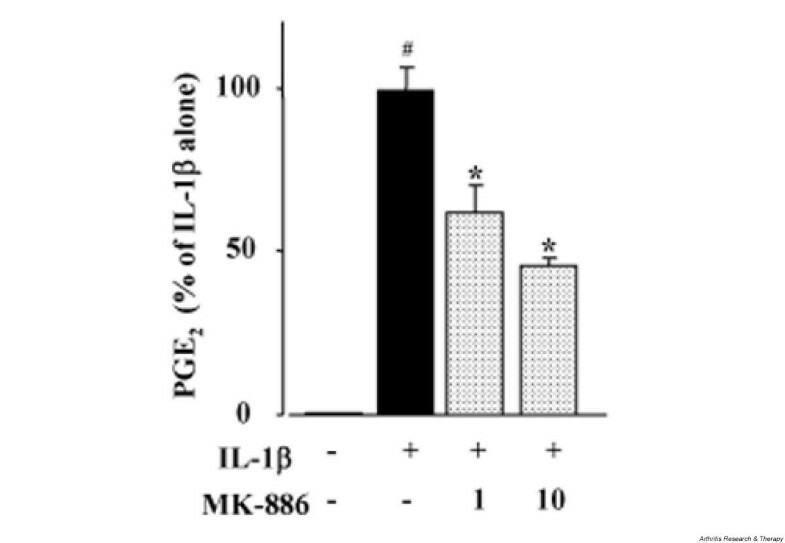 *P < 0.01 and †P < 0.05 compared with 0 h. (b) Chondrocytes were incubated with or without IL-1β (1 ng/ml) for 48 h. Then the PGES activity of the cell lysates in the presence or absence of MK-886 (1–100 μM) was measured as described in Materials and methods, and calculated as a percentage of the control value (IL-1β alone). Data are means ± SD for triplicate experiments; representative results from three patients are shown. #P < 0.01, untreated control compared with IL-1β alone; *P < 0.01, IL-1β alone compared with IL-1β plus MK-886. It was reported that MK-886 could inhibit mPGES-1 activity in mPGES-1 transfected cells . To evaluate the contribution of mPGES-1 to the IL-1β-induced increase of PGES activity in chondrocytes, we examined the effect of MK-886 on PGES activity in chondrocyte lysates. As shown in Fig. 7b, PGES activity in lysates from unstimulated chondrocytes was very low, and it was not affected by MK-886 alone. 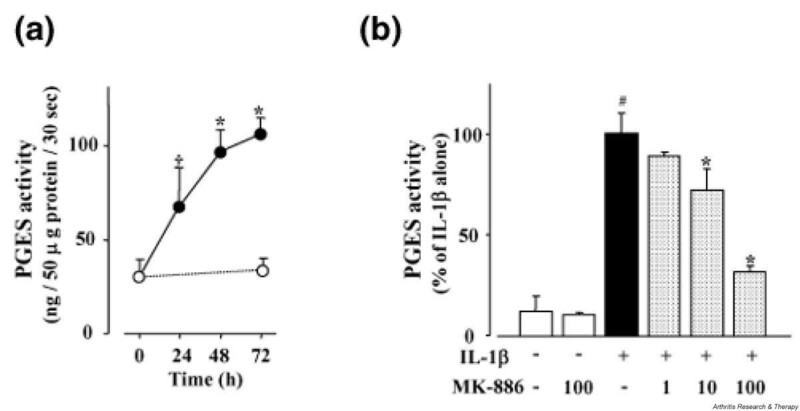 In contrast, the increased level of PGES activity in lysates prepared from IL-1β-stimulated chondrocytes was inhibited by MK-886 in a concentration-dependent manner. These results suggested that the induction of PGES activity by IL-1β in chondrocytes was dependent mainly on the enzymatic activity of inducible mPGES-1 rather than on constitutive mPGES-2 and cPGES. We next examined the effect of MK-886 on endogenous PGE2 production in IL-1β-stimulated chondrocytes. Chondrocytes were incubated with IL-1β for 48 h in the absence or presence of MK-886. As shown in Fig. 8, endogenous PGE2 production by OA chondrocytes was significantly increased after stimulation with IL-1β. When chondrocytes were cultured with IL-1β in the presence of MK-886, there was significant inhibition of PGE2 production in a concentration-dependent manner. Microscopy of the cells revealed severe toxicity of MK-886 at 30 μM (data not shown). Effect of MK-886 on endogenous prostaglandin E2 (PGE2) production in chondrocytes stimulated with IL-1β (IL-1β). Chondrocytes from patients with osteoarthritis were incubated with IL-1β in the presence of MK-886 (1 or 10 μM) for 48 h. The PGE2 concentration of the medium was then measured by enzyme-linked immunosorbent assay and calculated as a percentage of the control value (IL-1β alone). Data are means ± SD for triplicate experiments; representative results from three patients are shown. #P < 0.01, untreated control compared with IL-1β alone; *P < 0.01, IL-1β alone compared with IL-1β plus MK-886. Articular cartilage obtained from patients with OA was fixed in formaldehyde, embedded in paraffin, and cut into serial sections that were immunostained with antibody against mPGES-1 or COX-2. Chondrocytes in the articular cartilage from patients with OA were stained by the antibody against mPGES-1 (Fig. 9a). When the absorption control using mPGES-1 peptide was tested (Fig. 9b), mPGES-1 immunostaining was almost completely abolished. In addition, no mPGES-1 immunostaining was observed when rabbit anti-human mPGES-1 was replaced by normal rabbit IgG (Fig. 9c). COX-2 immunostaining was also positive in the chondrocytes (Fig. 9d), whereas the absorption control using COX-2 peptide (Fig. 9e) showed no COX-2 immunostaining. Expression of membrane-associated prostaglandin E synthase-1 (mPGES-1) and cyclooxygenase-2 (COX-2) protein in articular cartilage sections from osteoarthritis patients. Paraffin-embedded section of cartilage from osteoarthritis patients were subjected to immunostaining for mPGES-1 (a) and COX-2 (d). As adsorption controls for mPGES-1 (b) and COX-2 (e), primary antibodies that had been reacted with mPGES-1 and COX-2 peptide (10 μg/ml) were used, respectively. As a negative control for mPGES-1, rabbit anti-human mPGES-1 was replaced with normal rabbit IgG (c). Representative findings from three patients are shown here. In this study we demonstrated that mPGES-1 is a key enzyme in the regulation of PGE2 production in cytokine-stimulated chondrocytes from patients with OA. Although several studies on the induction of COX-2 and its regulatory mechanism in chondrocytes have already been published [16, 36, 37], this is the first report that mPGES-1, located downstream of COX-2, is induced in chondrocytes by cytokine stimulation. Among the various cytokines that we tested, IL-1β and TNF-α caused the induction of both mPGES-1 expression and COX-2 expression. In addition we demonstrated mPGES-1 and COX-2 immunostaining of chondrocytes in articular cartilage from patients with OA. There have been reports of a high level of IL-1β and TNF-α expression on the surface of OA cartilage, and the production of IL-1β in OA tissues seems to be correlated with the extent of cartilage damage [4, 38–40]. It was also reported that IL-1β expression is increased in synovial membrane tissues obtained from patients with OA at all stages of the disease [5, 41]. Our results suggested that expression of mPGES-1 and COX-2 in chondrocytes from patients with OA might be promoted by endogenous IL-1β and TNF-α released from cartilage and/or synovial tissue. Long-term culture and/or multiple passages of chondrocytes generally induce dedifferentiation of the cells. 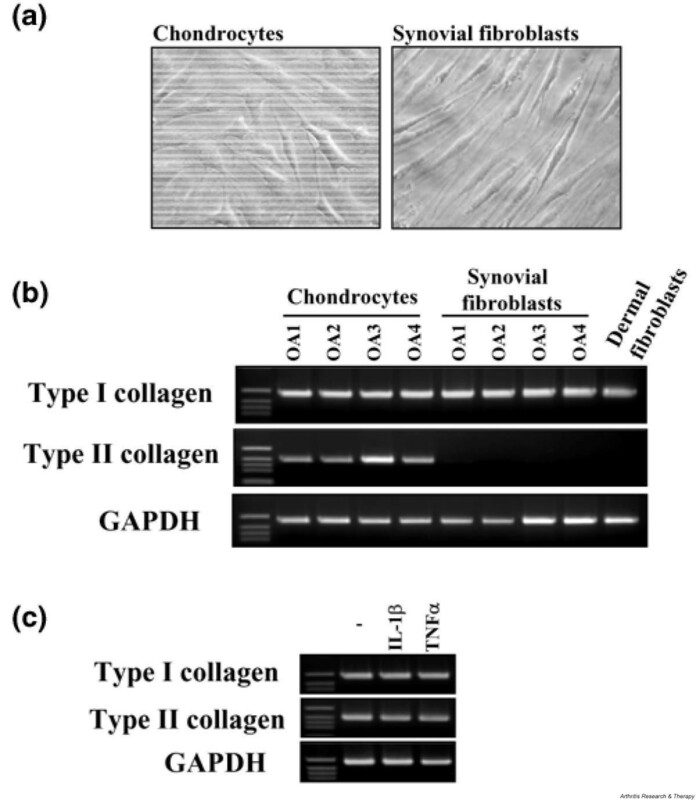 The existence of type II collagen, which is highly specific to chondrocytes, is one of the major phenotypic characterizations of this cell type; dedifferentiated chondrocytes lose the expression of type II collagen . In our study, the chondrocytes that we used expressed type II collagen and were clearly distinguished from synovial fibroblasts and dermal fibroblasts. Thus, we estimated that the chondrocytes in our study were maintained in a differentiated condition. We also studied the profile of PG synthesis in chondrocytes. PGE2 synthesis was markedly induced by IL-1β or TNF-α, whereas 6-keto-PGF1α and TXB2 synthesis were almost negligible in comparison. These results suggest that terminal PG synthase downstream of COX is important for deciding which PG is synthesized. In this study we showed that the expression of mPGES-1 and COX-2 was markedly induced by IL-1β in parallel with an increase in PGE2 synthesis. In contrast, PGI synthase and TX synthase mRNAs were detectable in chondrocytes by RT–PCR but were not induced by IL-1β (data not shown). Moreover, MK-886, which has an inhibitory effect on mPGES-1 activity , significantly inhibited IL-1β-induced PGES activity in lysates from IL-1β-stimulated chondrocytes. This inhibitor also reduced PGE2 production by intact chondrocytes after stimulation by IL-1β. These results suggest that the induction of mPGES-1 might be necessary for substantial PGE2 production by chondrocytes in response to proinflammatory stimuli. However, mPGES-1 is a member of the MAPEG (membrane-associated proteins involved in eicosanoid and glutathione metabolism) family, which also contains 5-lipoxygenase-activating protein and leukotriene C4 synthase. It has been shown that MK-886 inhibits not only mPGES-1 but also 5-lipoxygenase-activating protein  and LTC4 synthase . Alternative specific methods for inhibiting mPGES-1 therefore remain to be studied. Immunohistochemistry revealed that mPGES-1 and COX-2 protein colocalized to the perinuclear region of IL-1β-stimulated chondrocytes. We recently reported that mPGES-1 and COX-2 also showed perinuclear colocalization in IL-1β-stimulated rheumatoid arthritis synovial fibroblasts . Murakami and colleagues showed that mPGES-1 and COX-2 are functionally linked by using an mPGES-1 and COX-2 transfected cell line . Colocalization of mPGES-1 and COX-2 might be related to the preferential increase of PGE2 production after IL-1β stimulation due to functional linkage between these two enzymes in chondrocytes. The present study showed that the induction of mPGES-1 expression in chondrocytes was delayed compared with that of COX-2 and that it persisted for longer after stimulation with IL-1β. We previously found that increased expression of mPGES-1 was delayed in a similar fashion in IL-1β-stimulated rheumatoid arthritis synovial fibroblasts . This coordinated expression of mPGES-1 and COX-2 over time might sustain higher PGE2 production in OA chondrocytes. The different profiles of mPGES-1 and COX-2 expression also imply that regulation of these enzymes occurs through different pathways in chondrocytes. It was recently shown that mPGES-1 expression in response to various stimuli is regulated by a transcription factor, early growth response factor-1 , which was reported to bind to the proximal GC box in the mPGES-1 gene promoter. If different transcription factors are associated with mPGES-1 and COX-2, this might help to explain the different time course of the expression of these enzymes in IL-1β-stimulated chondrocytes. Cartilage damage is considered to be a major cause of OA, and chondrocytes seem to have a fundamental role in the pathogenesis of this condition . It was reported that cartilage is the main target of cytokines such as IL-1β and TNF-α in OA, and it seems that activated chondrocytes might be a major source of various inflammatory mediators associated with the progressive destruction of articular cartilage [47, 48]. Accordingly, the induction of mPGES-1 in cytokine-activated chondrocytes and the subsequent increase of PGE2 production might be important in the pathogenesis of OA. mPGES-1 is a specific enzyme that only catalyzes PGE2 production from PGH2. mPGES-1 might therefore be a potential new target for therapeutic strategies to specifically control the PGE2 synthesis associated with inflammation in patients with OA and other inflammatory diseases. mPGES-1 was upregulated by proinflammatory cytokines in OA chondrocytes and was one of the key enzymes in the regulation of PGE2 production. mPGES-1 might be important in articular inflammation with cytokine-stimulated conditions in patients with OA. We thank Mr Soichiro Kato, Ms Toshiko Mogi, Ms Hiroe Ogasawara, and Ms Natsuko Kusunoki for their support, and Ms Sonoko Sakurai for secretarial assistance. We also thank Dr Masako Mizoguchi and Dr Emiko Yamasaki for providing dermal fibroblasts. This work was partly supported by research grants from The Ministry of Education, Culture, Sports, Science and Technology of Japan. FK participated mainly in the experiments and drafted the manuscript. HN suggested the methodology of the experiments and assessed the results. SM, MB, and HA provided samples from the patients and assessed the results. SK conceived the study and participated in its design and coordination.